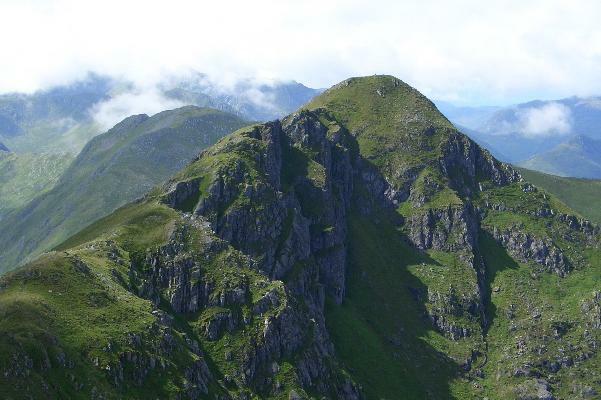 Sgurr an Lochain is one of the 7 Munros on the 14km South Glen Sheil Ridge. The ridge has steep slopes to the S and is very craggy with many corries to the N.
The traverse of the ridge follows the scalloped rims of the corries between peaks. The ridge may be climbed in two sections E and W but individual peaks are not easily accessed and do not require individual descriptions. Sgurr an Lochain in the W section is linked to Sgurr an Doire Leathain to the SE and Creag nan Damh to the NW. 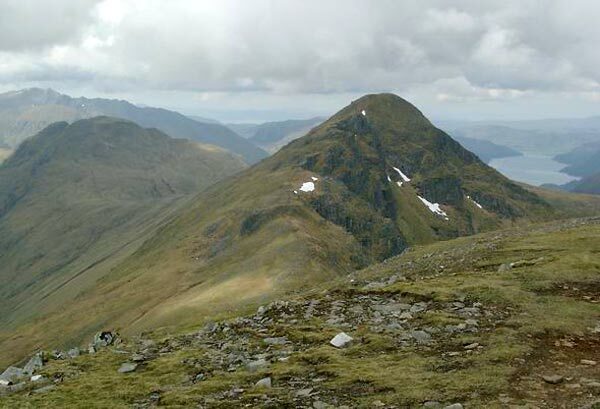 Sgurr an Lochain seen from Sgurr an Doire Leathain on the South Glen Shiel Ridge. Sgurr an Lochain from Sgurr Beag. Sgurr an Lochain seen from the A87 road in Glen Shiel. Looking west to Sgurr an Lochain with Creag nan Damph and Loch Duich beyond. 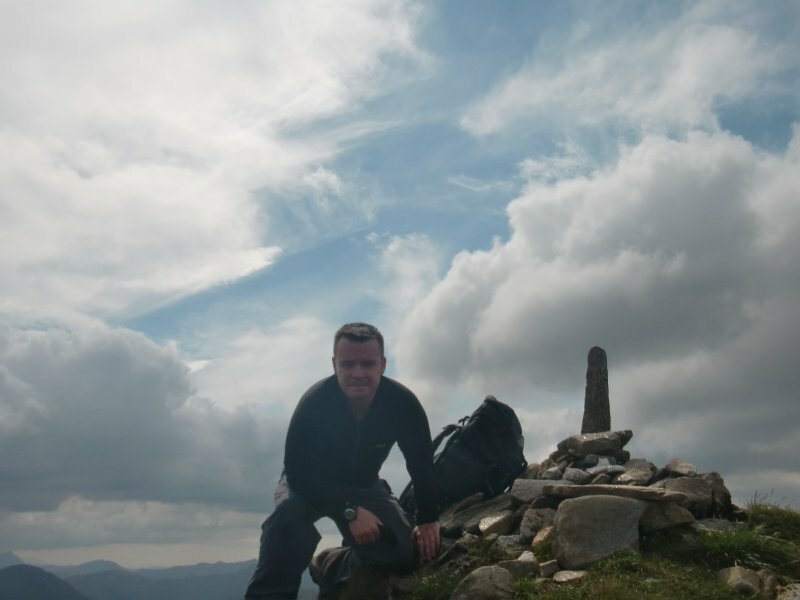 The summary information of one or more ascent routes that include Sgurr an Lochain. 1 1785 m 18.30 km 7 hrs Sgurr an Doire Leathain, Sgurr an Lochain and Creag nan Damh This is the west section of the South Glen Shiel Ridge. It is possible to traverse the whole ridge on a long summer day. Top of Sgurr an Lochain 06.07.12. 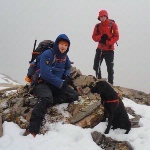 Post a few words about Sgurr an Lochain or read what others have had to say. Sadly, even the old tree trunk has now almost rotted away. Prepare to paddle! If you're not tackling the whole ridge and are planning to use the bridge at the foot of Druim a Choire Reidh to access Sgurr an Lochain, it's useful to know that said bridge has long since disintegrated. A rather fetching (and thin) old tree trunk is now in its place. The view to Sgurr Beag and Creag nan Damh from this munro was a particular highlight of walking the south glenshiel ridge. 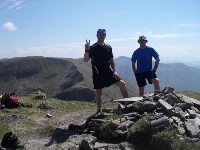 Climbed this mountain as part of day walk along the South Glen Shiel ridge. The walk is excellent and views over Knoydart to the south and the north Cluanie ridge are well worth waiting for a fine day. Out of the 7 Munros this is my favourite especially when viewed from Sgurr an Doire Leathain.